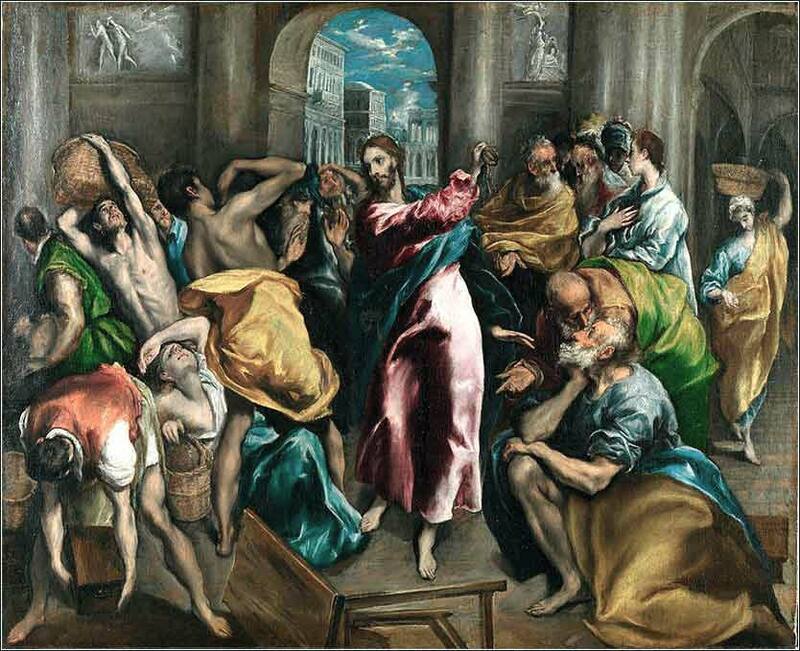 Christ Driving the Money Changers from the Temple by El Greco, ca. 1600. The Scripture today is about zeal and passion, and we see Our Lord himself filled with it here. 414 people in our community are currently praying with you. Here is a good thought for the entire week, interpreted by the Joyful Noise Rockin’ Gospel Choir. The illustrations are from a children’s book by E. B. Lewis. It is morning when the book opens, and readers are greeted by a smiling boy. Throughout the day, he spreads his own special brand of joy wherever he goes. Oh Holy God, look down upon me, a miserable sinner, and forgive me for the terrible things that I do, against your love for us and against the love that you have commanded us to show for our brothers and sister. The people of the world are your holy and beautiful children, oh Lord, and I am one of them also. I pray that you will fill me so full of your might and love that I will not sin against myself or anybody else, this day, or ever; but if I do, I plead with you, give me that undeserved grace you showed by the life and sacrifice of your Son, my Lord, Jesus Christ. Do not hide your talents. They were given to you to be used. What good is a sundial in the shade? Paul connects three ideas here. Sloth, or laziness, was traditionally one of the ”seven deadly sins” and was much emphasized by the Puritans. Who has not heard “idle hands are the Devil's playground”? Translated to today, Paul is warning against Sunday Christianity: going to church on Sunday and dropping a check in the collection plate. We must keep the Spirit active within ourselves, by reading, study and prayer, for the flesh is always with us and gives Satan constant opportunities to steer us wrong. It is good to have both a group and an individual discipline for prayer and study; because we learn more in private, but studying with others can buoy our spirit, increase our sense of fellowship with other Christians, and let us hear other voices to keep from making private error. Above all we must love God with passion. The Bible drives this home time and time again: We must seek God passionately. We must love God passionately. We serve and obey God passionately; we trust God passionately. And just in cast the message isn't coming across, read Colossians 3:23: “Do your best. Work from the heart for your real Master, for God, confident that you’ll get paid in full when you come into your inheritance. Keep in mind always that the ultimate Master you’re serving is Christ.” This is God's will for us; and He tells us to be passionate about serving Him, not for His sake, but for ours! Paul entreats us to serve the Lord and be fervent in our Spirit. We must work, somehow, for the spread of the Gospel and not be too embarrassed or quiet about our belief. This is harder for some people than others, for we all have different gifts, but we must make sure we use our gifts. For as Ben Franklin said, “what good is a sundial in the shade”? Angel with Waning Moon, William Morris ca. 1864. As well as the wallpaper and textiles that gave Morris his renown, he designed a number of stained glass windows. This watercolor, strongly influenced by the Pre-Raphaelites, is actually a design for a hand-painted tile to be used in the restoration of the Hall of Queen's College, Cambridge.